A three-dimensional steady-state mathematical model, considering the chemical reactions and transfers of momentum, heat and mass between the gas and solid phases, was developed to investigate the characteristics of the shaft furnace with the central gas distribution (CGD) device. The model was verified by the practical production data of a COREX-3000 shaft furnace, and then, it was used to study the inner characteristics of the shaft furnace with CGD. The results show that, compared with the COREX shaft furnace without CGD, the gas utilization rate (UR) and solid metallization rate (MR) increase from 33.66% to 34.18% and 60.4% to 61.8%, respectively. Especially, the standard deviation of solid MR decreases from 6.9% to 0.8%, which means that the MR of direct reduced iron from the furnace with CGD is more uniform than that without CGD. 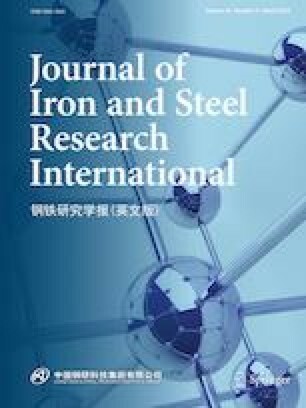 Additionally, the effects of operational conditions and CGD design on gas UR, solid MR and direct reduced iron uniformity were further discussed and the optimized conditions were suggested. The authors would like to thank the National Key Technology R&D Program during the “12th Five-year Plan” of China (Grant No. 2011BAE04B02) and the National Natural Science Foundation of China (Grant No. 51574064) for their financial support.